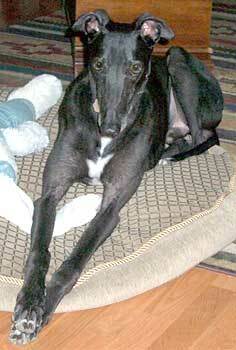 Skittles, aka Sandhill Skillet, is a 5½-year-old black male greyhound, born June 9, 2001. His sire is Grenade, making his grand-sire Molotov, and his dam is Starlight Kissy. 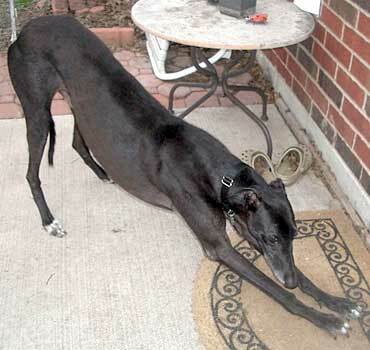 Skittles was found as a stray on a farm north of Hillsboro on Thursday, October 26, 2006. 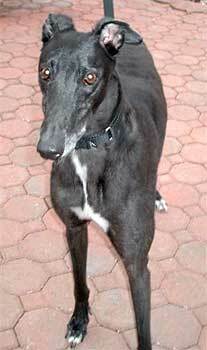 According to Greyhound-Data.com, Skittles finished the last of his 259 races on June 19, 2006, at Daytona Beach, Florida, ending quite a career that started December 31, 2002. His whereabouts since that last race to October 26 are unknown, although the NGA owner of record said he had given Skittles to a man to use for rabbit hunting, who lives on the Oklahoma/Texas border, because he was an "old dawg." He arrived twenty-four pounds below his racing weight and severely malnourished, which as we all know, can be deadly in itself. Skittles' journey from the brink of death to a healthy greyhound is a story of courage, hope and the power of love and care. Skittles was watched over by Angels from the east to the west coast, Canada and England; so many were praying for him, sending him well wishes and helping with his medical expenses. These Angels cheered him on to help in truly the most important race of his life. Skittles again proves he is a winner and champion in every sense of the word. Now to find his forever home and loving family! Skittles is small animal and cat tolerant.